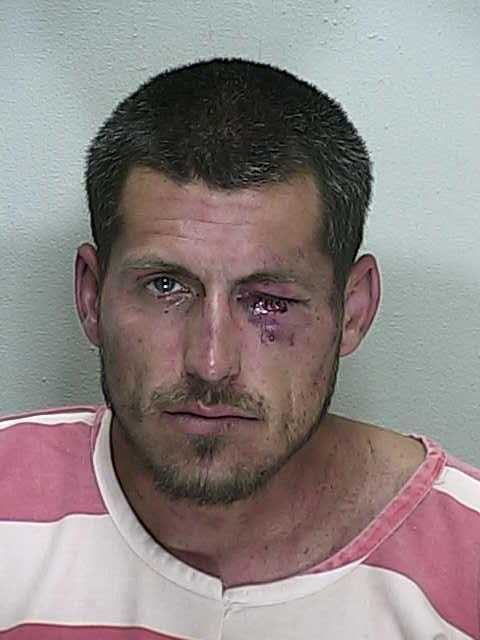 Summerfield, Florida — Marion County Sheriff’s deputies arrested a man and chargeg him with five felonies after they say he resisted after being handcuffed. On May 19, 2014, Deputy Douglas Watts responded to the 1400 block of SE 55 Avenue in reference to a domestic altercation. When Deputy Watts arrived on the scene he could see Robert Wood, 28, holding a female victim by the hair while trying to drag her inside the residence. Watts instructed Wood to stop and place his hands behind his back. According to reports, Wood was compliant and followed Watts’ orders until he and the victim began talking, which aggravated Wood to the point he became aggressive. Deputy Watts said that Wood walked up to him and began bumping him with his chest. Deputy Travis O’cull arrived on the scene shortly after Wood became aggressive. According to Deputy O’cull, when he arrived Watts was on top of Wood in the front yard of the residence. O’cull said that Wood was kicking his feet and trying to grab deputy Watts’ hands and fingers, while at the same time trying to rotate his body in an attempt to get up. Deputies Watts and O’cull said as they began walking Wood to a patrol vehicle, Wood wrapped both of his legs around Watts’ left leg which caused all three of them to fall. According to the deputies, they gave several verbal commands to Wood instructing him to stop. Deputy O’cull then gave several knee strikes to Wood’s left side between his shoulders and waist. Deputy O’cull said the knee strikes were successful. Once they were at the patrol vehicle, Wood was placed into leg restraints to keep him from kicking. Deputy O’cull then spoke with the victim whom had a swollen left eye, chunks of hair pulled from her head and a bloody mouth. The victim said she had gone to the residence so she could pick up her clothes and personal items since she and her boyfriend were breaking up. She said when she arrive at the residence Wood was intoxicated and she had a feeling something was going to happen. She then took her children to a neighbors house. Shortly after, Wood started and argument with her so she decided to leave. As she was leaving, Wood followed her and began punching her. She said she was able to make it to her vehicle, but he reached into the car and began punching her repeatedly with a closed fist. She said he then grabbed her by the hair and started slamming her head into the head rest. With one hand holding her hair, he placed his other hand over her nose and mouth so tight that she couldn’t breathe, at which point she began to blow the horn. During the commotion, deputies learned that Wood had also struck one of the children with a belt approximately two weeks earlier. According to reports, Wood hit the child so hard [that] the belt marks were still visible. Wood was transported to the hospital, treated and released. He was then transported to the Marion County Jail. He is charged with Cruelty Toward a Child/Child Abuse (F), Domestic Battery by Strangulation (F), Battery on a Law Enforcement Officer (F), Resisting Arrest with Violence (F) and Violation of Probation (F). He is currently still being held at the Marion County Jail.